The HCS will be featuring fine examples of built heritage structures transformed into commercially-sustainable business projects. You will find elegant family residences that have been recycled into boutique hotels and banks; a century-old train terminal (Tutuban) became a shopping mall and the first international airport of Manila (Nielson Tower) was restored and recycled into a library and bookstore. 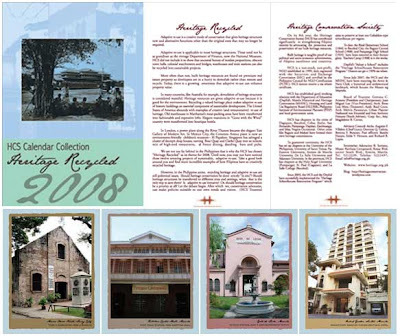 All these are compiled into the 2008 Heritage Calendar/Postcard Collection called HERITAGE RECYCLED. These unique calendars are excellent Christmas gifts to your friends and business associates. You can also have your company and/or personal logo printed on the standee. As you know, the HCS is a non-profit group. One of our main objectives is to show how the restoration of heritage structures can enhance the value of real estate development projects, urban planning, and tourism. Adaptive re-use is a creative mode of conservation that gives heritage structures new and alternative functions other than the original ones that may no longer be required. Adaptive re-use is applicable to most heritage structures. These need not be as grandiose as the vintage Department of Finance, now the National Museum. HCS did not include it to show that ancestral homes of modest proportions, obscure town halls, colonial watchtowers and bridges, warehouses and train stations can also be recycled into sustainable projects. Most often than not, built heritage resources are found on premium real estate property so developers are in a hurry to demolish rather than restore and recycle. Today, there is a growing awareness that adaptive re-use can enhance property value. In many countries, like Australia for example, demolition of heritage structures is considered wasteful. Heritage resources are given adaptive re-use because it is good for the environment. Recycling a valued heritage place makes adaptive re-use of historic buildings an essential component of sustainable development. The United States of America abounds with examples of creative (and remunerative) re-use of heritage. Old warehouses in Manhattan's meat-packing areas have been transformed into fashionable and expensive lofts. Elegant mansions in "Gone with the Wind" country were transformed into boutique hotels. In London, a power plant along the River Thames became the elegant Tate Gallery of Modern Art. In Mexico City, the Cemento Azteca plant is now an environment-friendly children's museum-- El Papalote. Singapore has salvaged a cluster of decrepit shop houses, turning Boat Quay and Clarke Quay into an eclectic mix of high-end restaurants, al fresco dining, dazzling bars and pubs. We are not too far behind in the Philippines that is why the HCS has chosen "Heritage Recycled" as its theme for 2008. Until now, you may not have noticed these twelve amazing projects of sustainable, adaptive re-use. Take a good look around you and find more incredible examples of how Filipinos have so creatively recycled heritage. 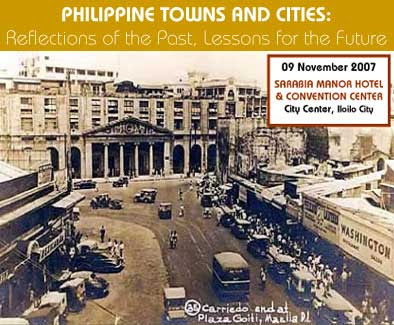 However, in the Philippine scene, recycling heritage and adaptive re-use are still polemical issues. Should heritage conservation be done strictly "in situ"? Should heritage structures be transferred to different sites and settings, when that is the only way to save them? Is adaptive re-use intrusive? Or, should heritage conservation be a priority at all? Let the debate begin. After which we, conservation advocates, can make policies suitable to our own needs and vision. 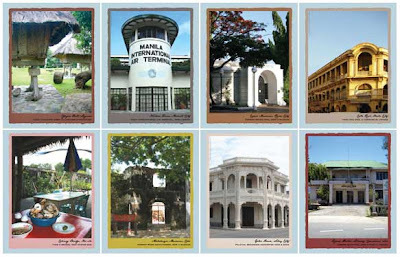 This attractive book is the first publication to present all five World Heritage properties located in the Philippines in a single volume. Widely acknowledged by the international scientific community as a "biodiversity hotspot", the Philippines hosts an astoundingly rich and varied network of terrestrial and marine life. Moreover, the distinctive blend of Eastern and Western architectural principles and technology that has evolved in the Philippines has given rise to sites of outstanding aesthetic and cultural values. 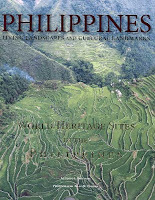 For example, the Rice Terraces Cultural Landscape of the Philippine Cordilleras, inscribed on the World Heritage List in 1995, has been shaped by traditional know-how handed down from successive generations. Furthermore, these magnificent rice terraces provide an exquisite setting for the traditional Hudhud chants of the local Ifugao people, which were recognized in 2001 by UNESCO as a Masterpiece of the Oral and Intangible Heritage of Humanity. Consequently, this unique yet fragile cultural landscape has come down through the ages as a testimony to the harmonious balance between heritage of humankind - both tangible and intangible - and the environment. This publication received financial support from the World Heritage Fund. It was launched at UNESCO Headquarters in June 2007 to celebrate the 35th anniversary of the adoption of the 1972 UNESCO World Heritage Convention. UNESCO considers that such activities contribute positively to the ongoing debates on the many issues and challenges concerning the implementation of the World Heritage Convention in developing countries.